Blueberry Scones-moist and tender blueberry scones with a sweet streusel topping and vanilla glaze! The perfect scone recipe for breakfast or brunch! Blueberry baked goods are my jam. I am seriously obsessed. Blueberry muffins, lemon blueberry sweet rolls, blueberry cream cheese biscuits, blueberry banana bread…yeah, I could go on and on. I love putting blueberries in all of my baked goods. 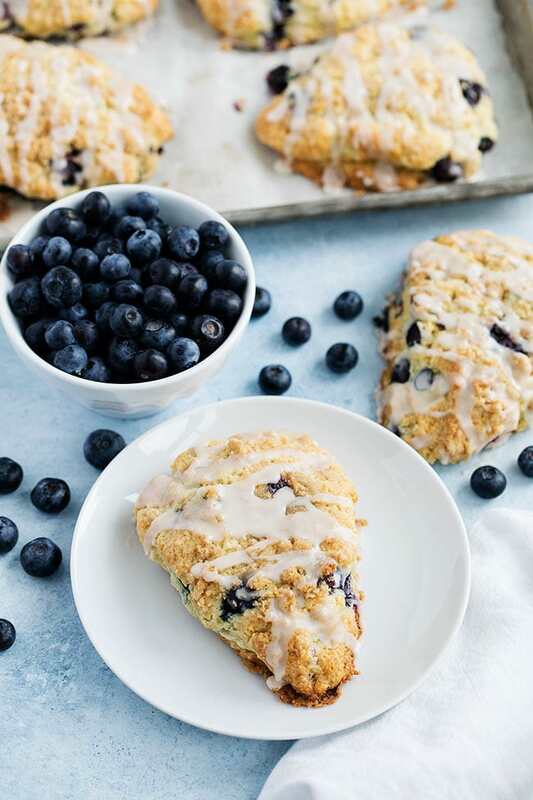 Blueberry scones are at the very top of my list and this blueberry scone recipe is my all-time favorite. 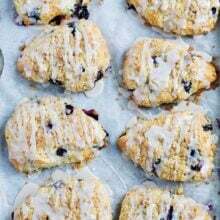 The soft and tender scones are bursting with blueberries and they get finished with a sweet streusel topping and a vanilla glaze. WOW is right! Bakery style scones that are easy to make at home? Can I get a YES, PLEASE! 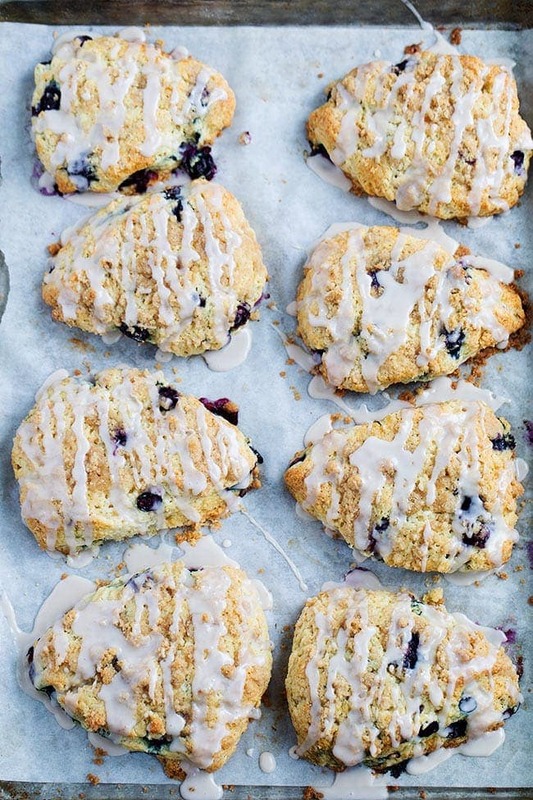 Good news, you can use fresh or frozen blueberries to make scones. When blueberries are in season and on sale, I use fresh blueberries. When I can’t find good blueberries or they cost an arm and a leg, I use frozen. So you can make blueberry scones year round, we always have frozen blueberries in our freezer. Can I Use Milk Instead of Heavy Cream? 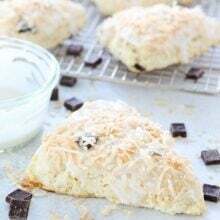 I like using heavy cream in this scone recipe because it keeps the scones super moist, tender, and rich. It is worth buying heavy cream to make these scones, trust me! These scones are a treat and you want to go all out! If you haven’t made scones before, don’t worry, they are easy to make. Here are a few tips that will help you make perfect blueberry scones every single time! 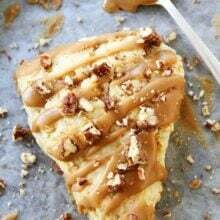 This scone recipe has a streusel topping and trust me, you don’t want to skip it! Make the streusel topping first and stick it in the fridge while you make the scones. Check the date on your baking powder and baking soda to make sure they are fresh. Yes, they do expire! Make sure the butter, heavy cream, and egg are COLD! Keep the ingredients in the fridge until you are ready to use them. You can even cut your butter into pieces and put it in the freezer while you prep the other ingredients. I like to do this if it is hot outside. You don’t want warm butter! Whisk together the dry ingredients in a large bowl and whisk together the wet ingredients in a separate bowl. Add the pieces of cold butter to the dry ingredients and lightly toss until all of the pieces are coated. Using a pastry cutter or your fingers, quickly cut the butter into the flour mixture until the mixture is pebbly. You want there to still be little chunks of butter, about pea size. Don’t over mix. Pour the wet ingredients over the dry ingredients and use a fork to gently stir together. Don’t over stir, the mixture will be wet and sticky. GENTLY stir in the blueberries. I stress the word gently because if you overdo it, you will end up with blue scones. Still in the bowl, knead the dough a few times until the dough comes together. Place the scone dough on a lightly floured surface. Gently pat and shape the dough into a 3/4-1-inch thick circle. Use a sharp knife to cut the scones into 8 even triangles. Place the scones on the prepared baking sheet and brush with heavy cream. Remove the streusel from the refrigerator and sprinkle the scones generously with streusel topping. Lightly press the topping into the scones. Place the scones on the baking sheet in the freezer for 20 minutes before baking. Freezing the scones for 20 minutes helps make sure all of the ingredients are super cold and will help the scones keep their shape and rise up nice and tall. Bake the scones for 17-22 minutes or until they are golden brown. Remove from the oven and let cool. Drizzle with the vanilla glaze. Scones are best the day they are made, but you can keep them in an airtight container for up to 2 days on the counter. Yes! You can freeze scones before baking them or after they are baked. If you want to freeze them before they are baked, place them on a baking sheet and freeze until solid, about 30 to 40 minutes. Place in a freezer bag or container and freeze for up to 2 months. If you are going to layer the scones on top of each other, make sure you put parchment paper between the scones so they don’t stick. When ready to bake, place the frozen scones on a large baking sheet with parchment paper and bake according to the directions, just increase the baking time by a few minutes. They will take a little longer to bake because they are frozen solid. If you want to freeze baked scones, let them cool completely. Place in a freezer bag or container and freeze for up to 2 months. If you are stacking the scones, make sure you put parchment paper between the scones. Defrost on the counter before serving. You can reheat in the microwave, but they will get a little soggy if you choose this method. I love making blueberry scones for a special breakfast treat on the weekends. You can’t beat a fresh scone that is bursting with blueberries. And the streusel topping and vanilla glaze? Talk about scone perfection. These blueberry streusel scones will remind you of your favorite blueberry muffin! 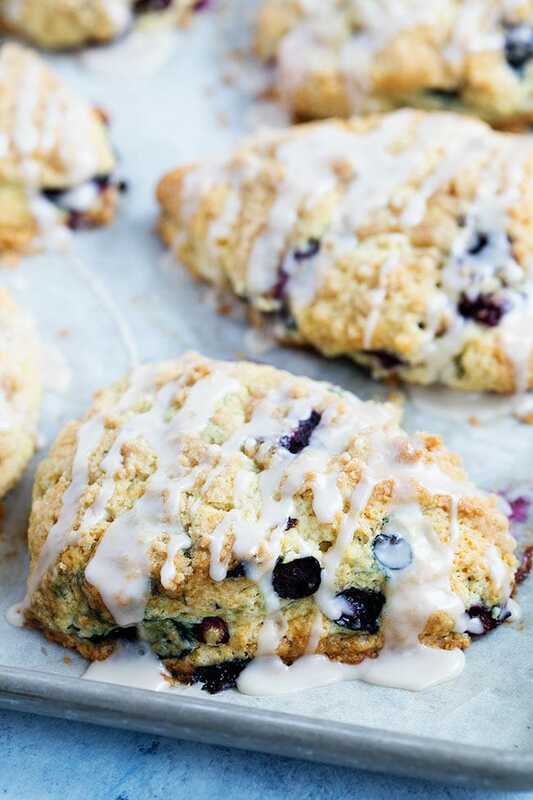 Serve blueberry scones for breakfast, brunch, tea time, or dessert! They are good anytime of the day! And if you want to WOW your family and friends, make them for special occasions-Easter, Mother’s Day, Father’s Day, Christmas…you can’t go wrong! Moist and tender blueberry scones with a sweet streusel topping and vanilla glaze! The perfect scone recipe for breakfast or brunch! Preheat oven to 400 degrees F. Line a baking sheet with parchment paper and set aside. To make the streusel topping: In a small bowl, combine the flour, brown sugar, and butter. Mix together with your fingers until the butter is incorporated and the mixture resembles large crumbs. Put in the refrigerator until ready to use. 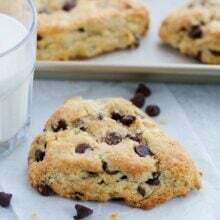 To make the scones: In a large mixing bowl, whisk together flour, sugar, baking powder, baking soda, and salt. Set aside. In a small bowl, whisk together 1 cup of the heavy cream, egg, and vanilla extract. Add the pieces of cold butter to the dry ingredients and lightly toss until all of the pieces are coated. Using a pastry cutter or your fingers, quickly cut the butter into the flour mixture until the mixture is pebbly. You want there to still be little chunks of butter, about pea size. Don't over mix. Pour the cream mixture over the dry ingredients and use a fork to gently stir together. Don't over stir, the mixture will be wet and sticky. Gently stir in the blueberries. Still in the bowl, knead the dough a few times until the dough comes together. Place the scone dough on a lightly floured surface. Gently pat and shape the dough into a 3/4-1-inch thick circle. Use a sharp knife to cut the scones into 8 even triangles. Place the scones on the prepared baking sheet and brush with the remaining heavy cream. Remove the streusel from the refrigerator and sprinkle the scones generously with streusel topping. Lightly press the topping into the scones. Place the scones on the baking sheet in the freezer for 20 minutes before baking. 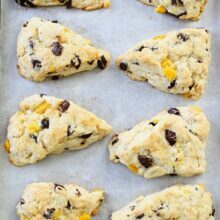 Remove the scones from the freezer and place the baking sheet in the oven, on the middle rack, and bake for 17-22 minutes or until the tops and edges are golden brown and the scones are set but still slightly soft in the center. Remove from the oven and let the scones cool on the baking sheet for 5 minutes. Transfer to a wire cooling rack and cool completely. While the scones are cooling, make the glaze. In medium bowl, whisk together the confectioner's sugar, 2 tablespoons milk, and vanilla extract. Whisk until smooth, if the glaze is too thick, you can add a little more milk. Drizzle the glaze over the cooled scones. Enjoy!